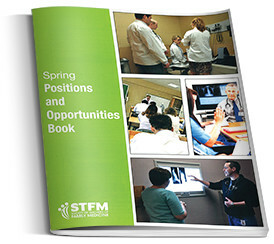 The STFM Positions and Opportunities Book is a dedicated career opportunities resource for family medicine professionals seeking positions in education and research. The Positions and Opportunities Book is published twice per year in the Spring and Fall. The Spring issue is produced and distributed in partnership with the Annual STFM Spring Conference. The Fall issue is an online-only version that reaches the members of the Society of Teachers of Family Medicine and beyond. Several combination advertising packages are offered to maximize your advertising exposure and receive volume pricing. Package options include the addition of Family Medicine, Annals of Family Medicine and FamilyMedicineCareers.com.